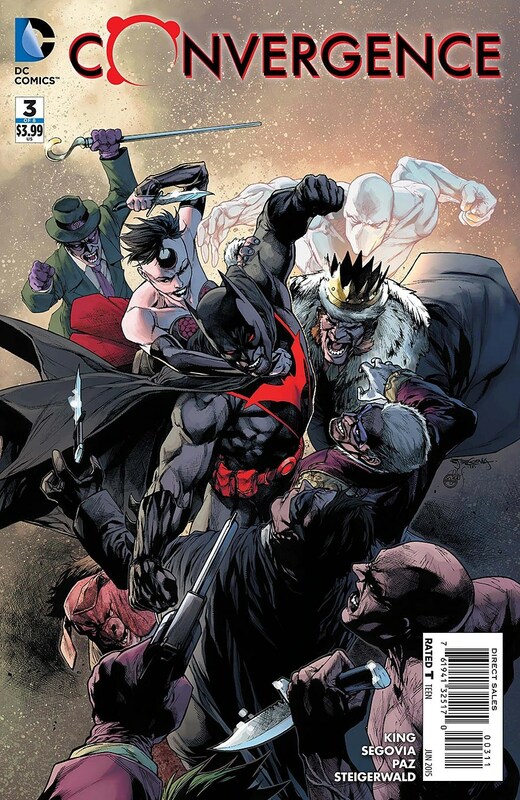 Yes, that is Monarch popping up again in the DCU. But which Monarch is it? 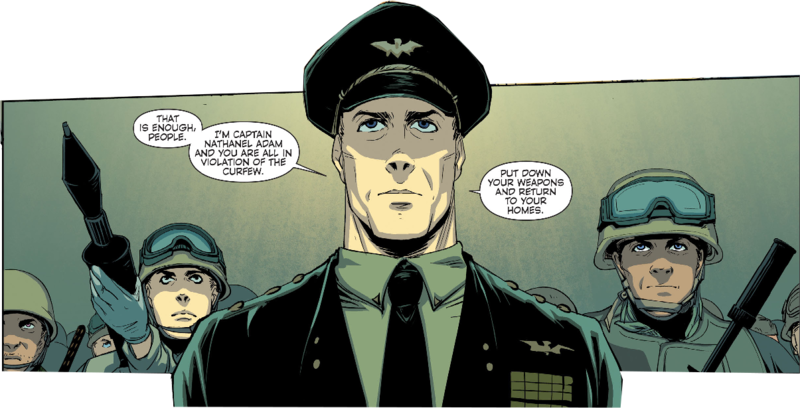 One Monarch is Hank Hall (Hawk), but the most-used Monarch is a version of Nathaniel Adam that I really haven’t tackled much on this blog yet. Honestly, he gives me a headache. 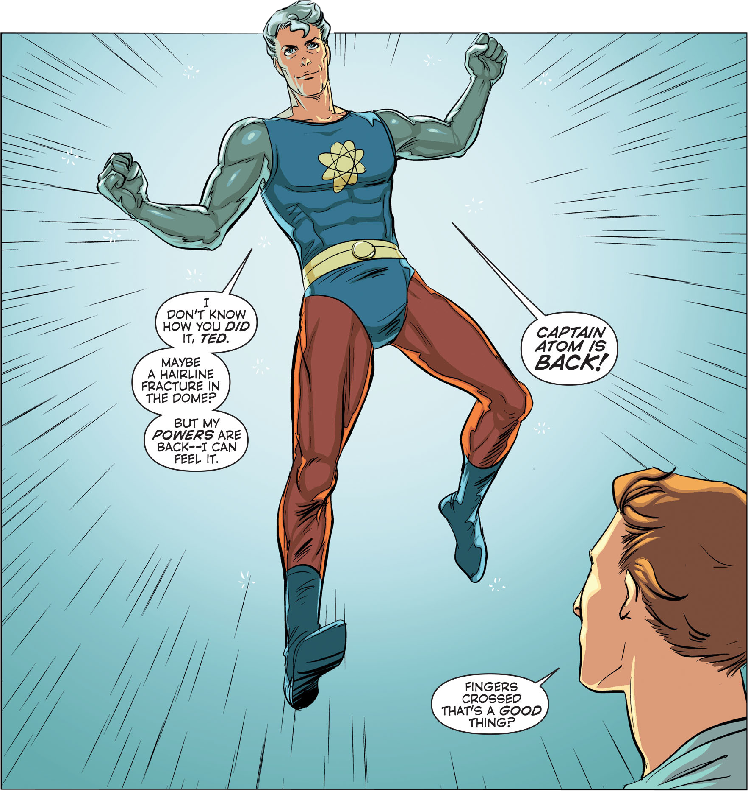 But he is Nathaniel Adam and is as much a version of Captain Atom as the Legion Lost character “Captain Adym.” So there you have it. 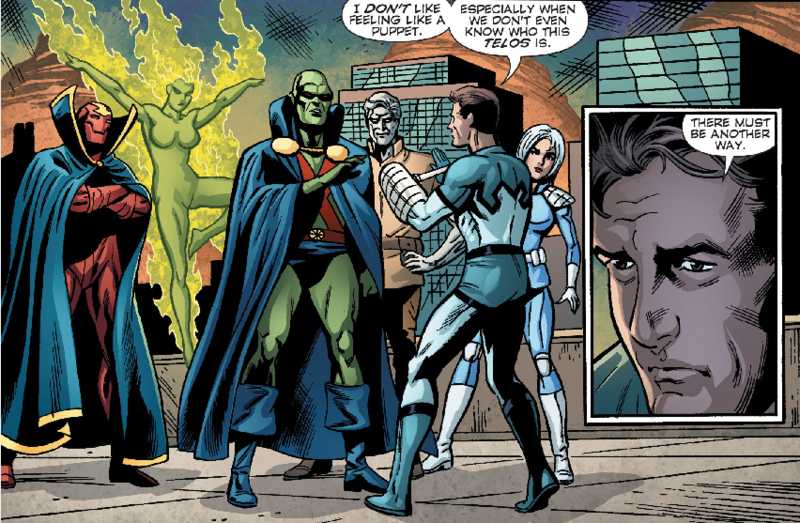 A quick Monarch cameo in Convergence. 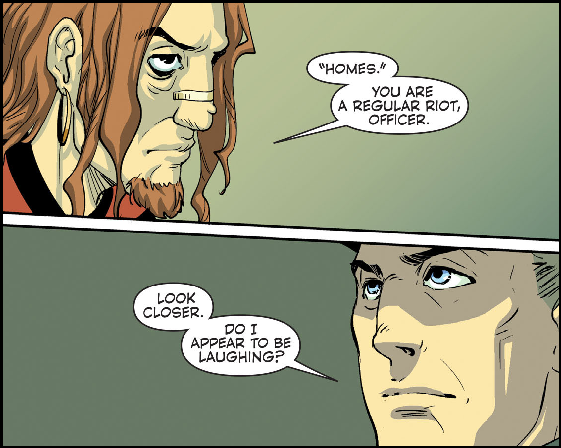 Hank Hall or Nathaniel Adam? Not sure. 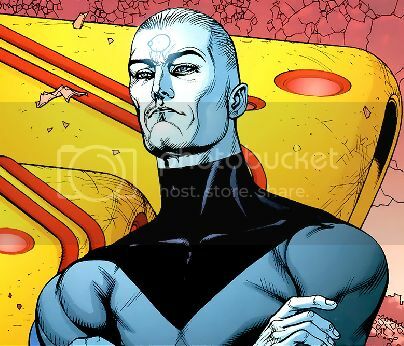 But Monarch will forever be a part of Captain Atom. 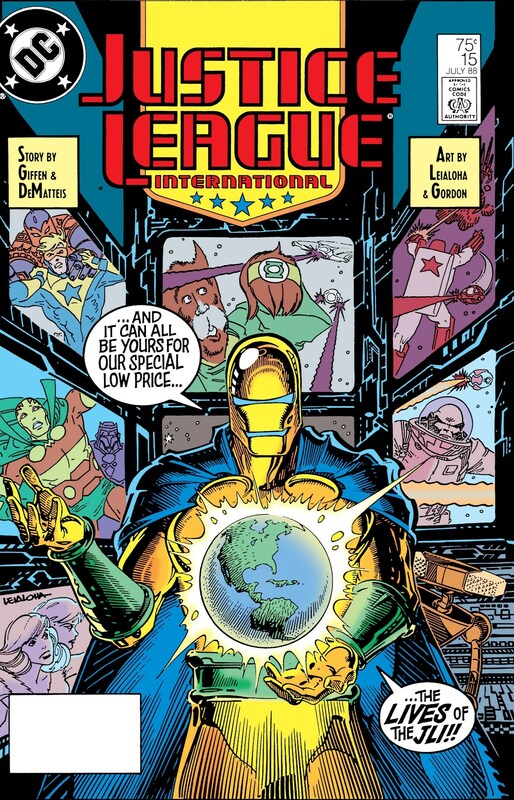 The Convergence continues and after a four-year absence from the DCU, the Modern Age Captain Atom returns (along with his JLI team-mates). And Cap is front and center on the cover. 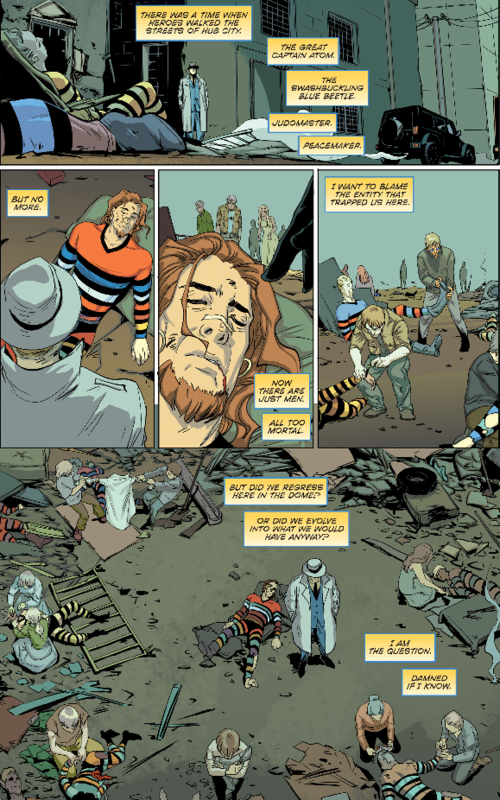 The story opens in pre-Zero Hour Metropolis. 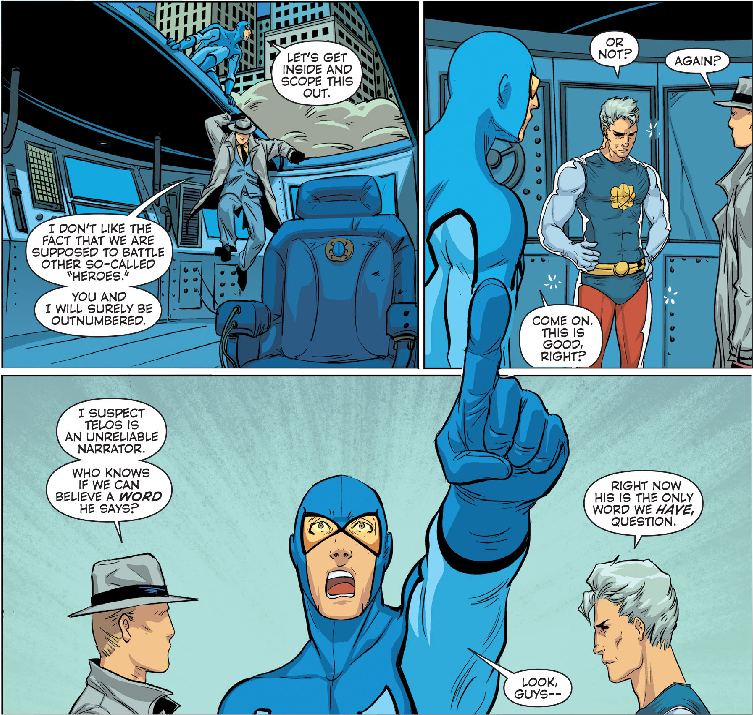 Ted Kord (Blue Beetle) is still alive (and having a fling with Fire) and Captain Atom is still in the Justice League. 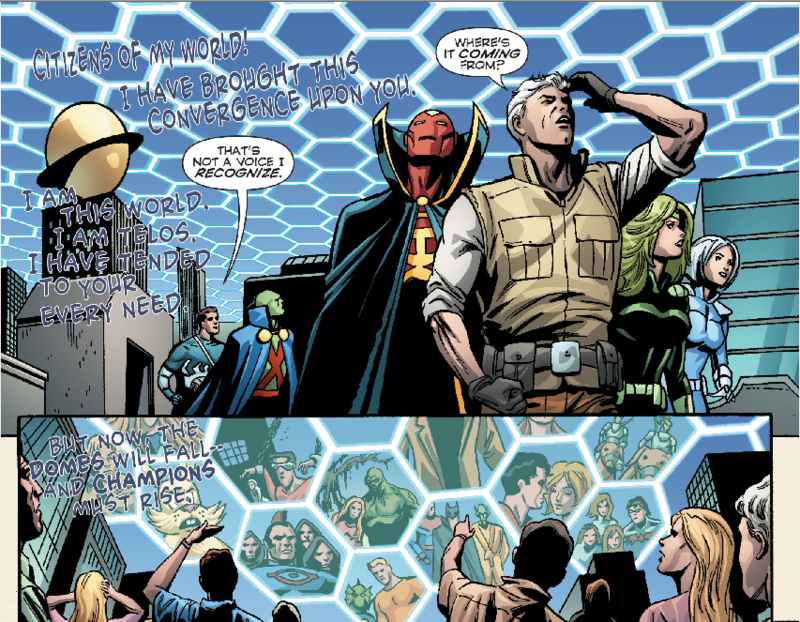 Metropolis is one of the cities being terrorized by Telos and is surrounded by a power-dampening dome. 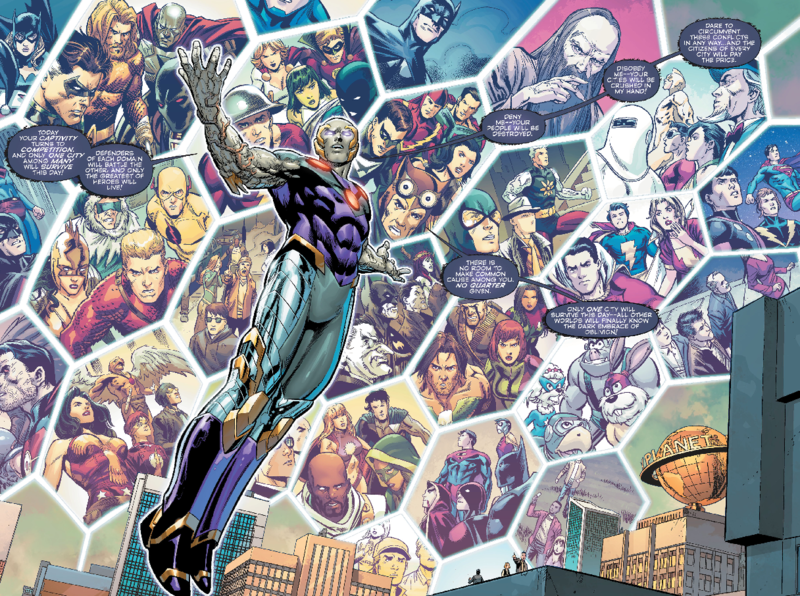 Metallo shows up with an army of metallic men and announces he is seizing control of the city. 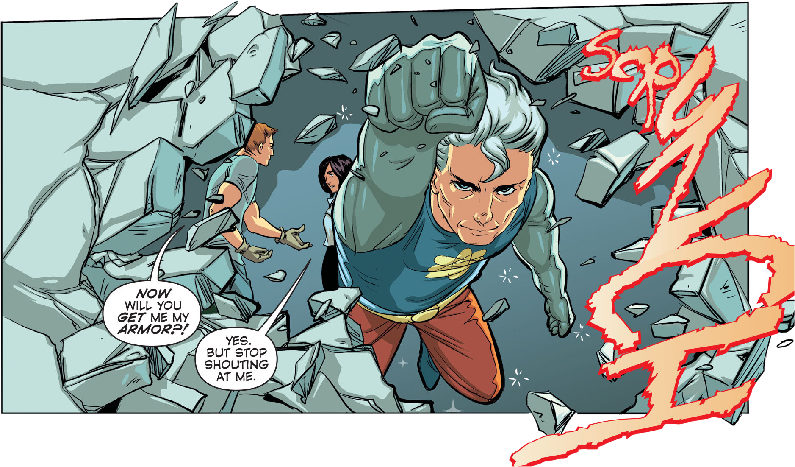 He doesn’t wreak havoc for long before the Justice League turns up. 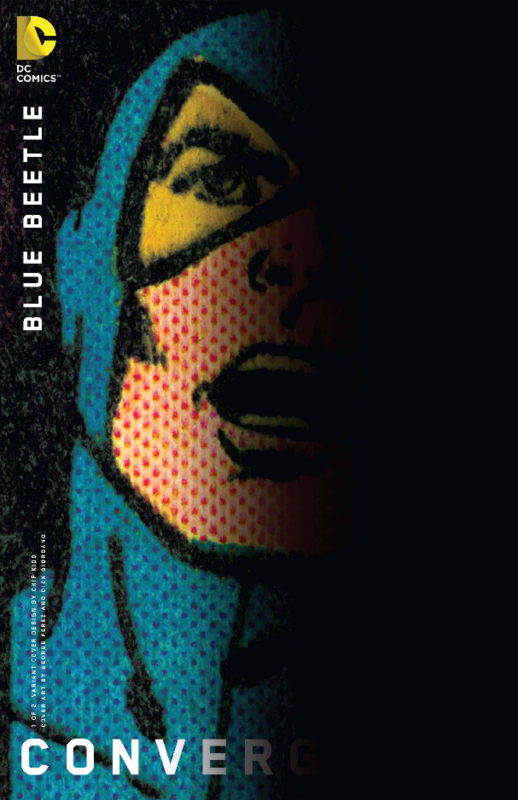 Led by Blue Beetle, the only member who has powers is Red Tornado (his android body uses technology, not super powers, and he feels no effect from the dome). 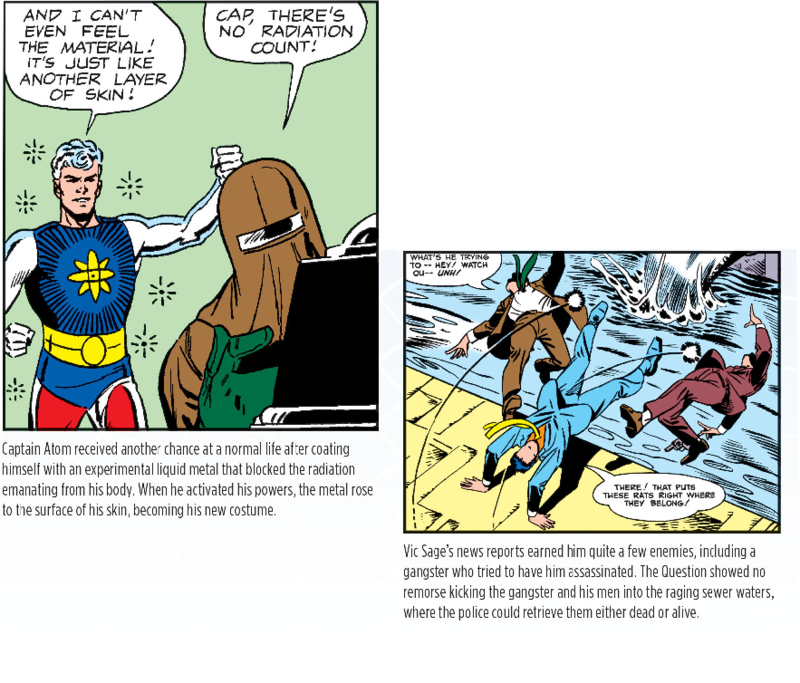 The citizens of Metropolis are used to being saved by Superman, but the man of steel is not around. 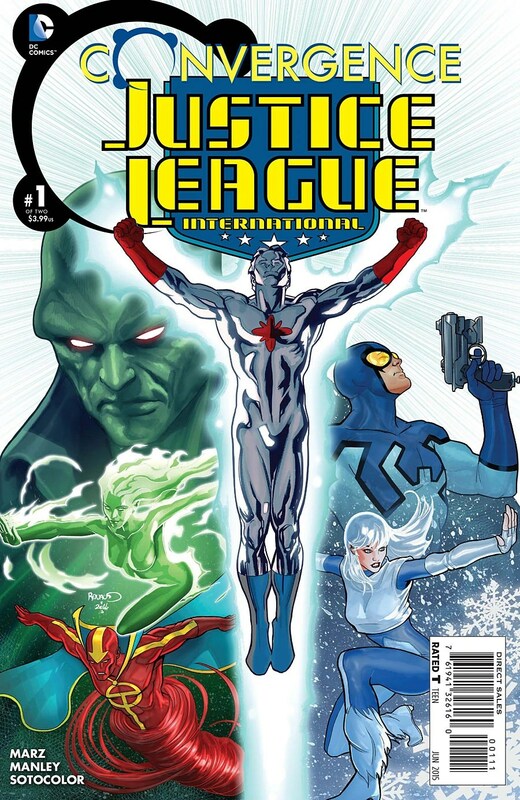 Unable to use their powers, Fire, Ice, Martian Manhunter, and Captain Atom rely on their strength, fighting skills, and weapons to take out the metallic army. 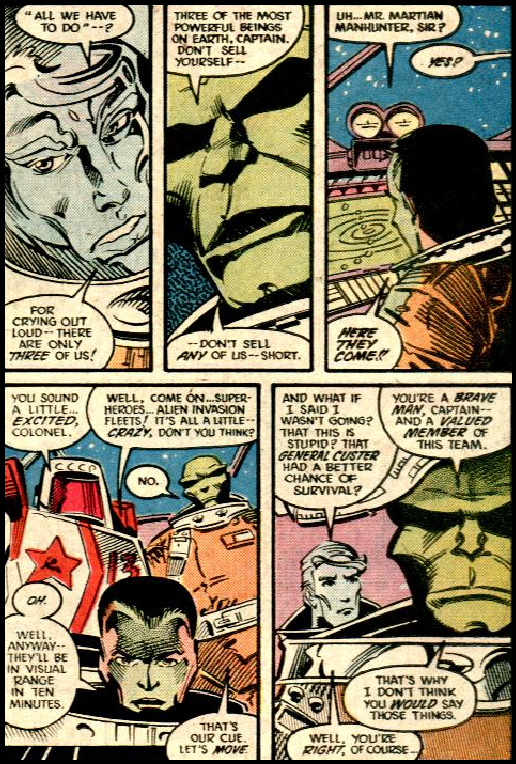 Beetle tries to keep the mood light by being funny (but not quite as funny as he was in the Keith Giffen/J.M. 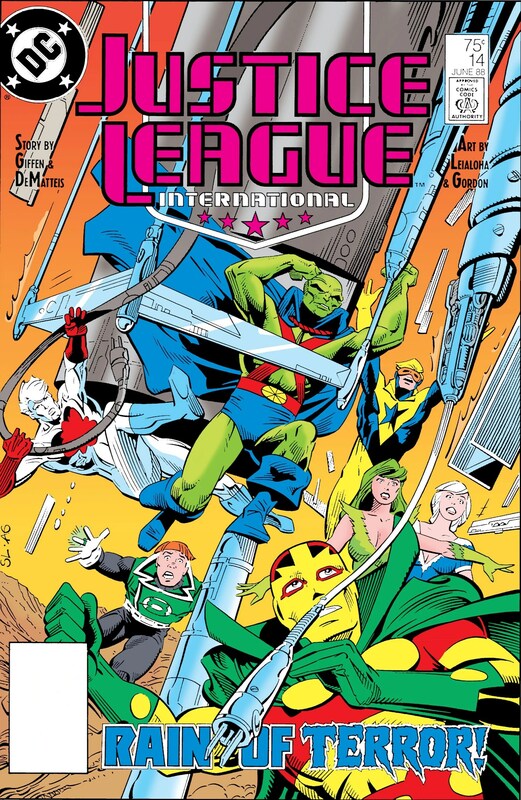 DeMatteis era of the Justice League) even as he is ripped out of the bug (receiving a broken arm in the process). 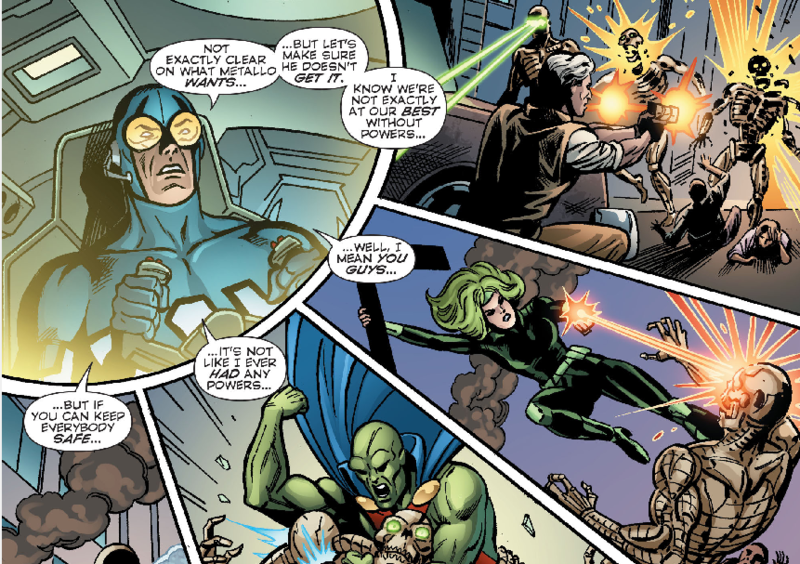 Beetle takes out Metallo using an undetermined gadget of his own design, which results in all the metallic men shutting down. 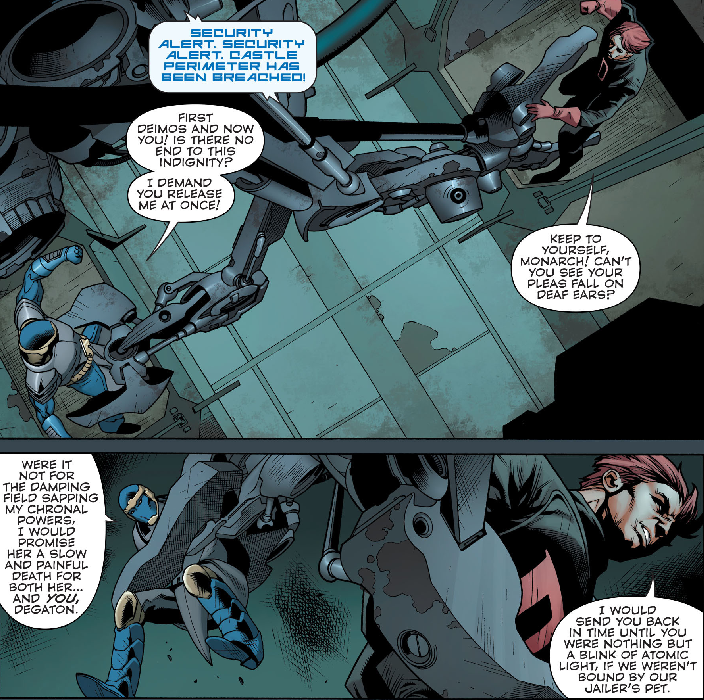 A local shop owner accosts Blue Beetle, wanting to know who is going to repair the damage to his store. 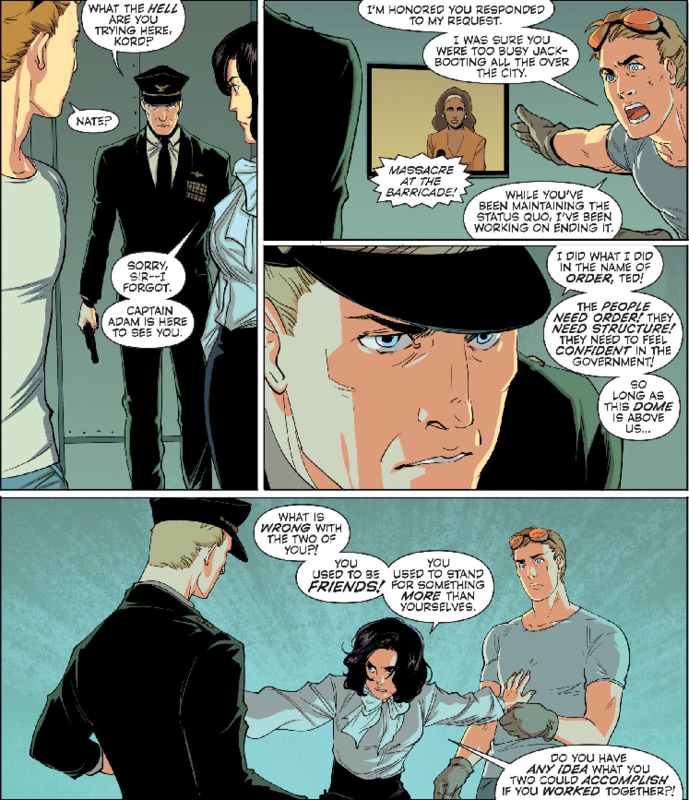 He makes a snarky comment about there being no “real heroes” left in the world. 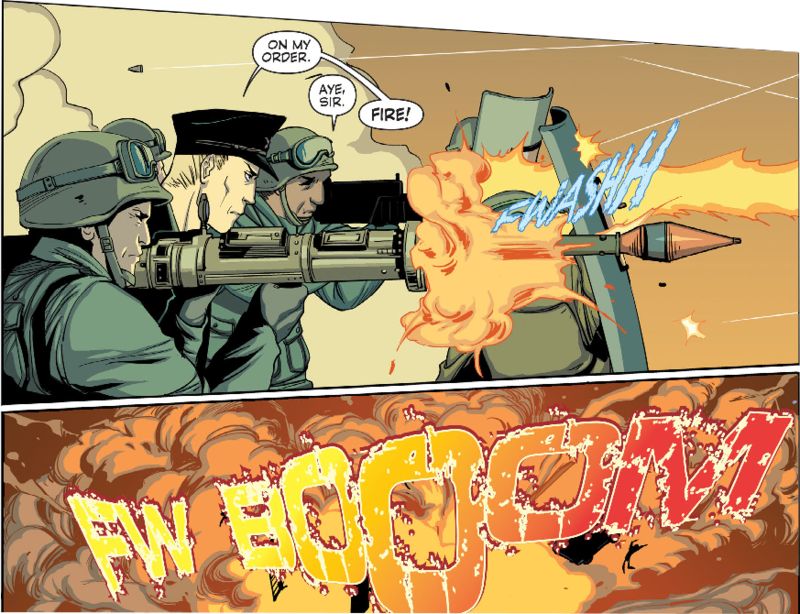 The team returns to their Metropolis headquarters to assess their damages. 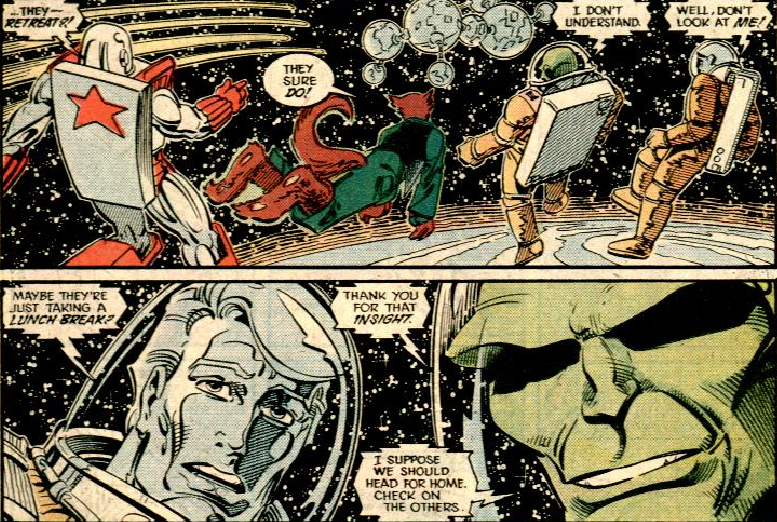 Aside from the Bug being severely damaged and Beetle’s broken arm, the team is fine. 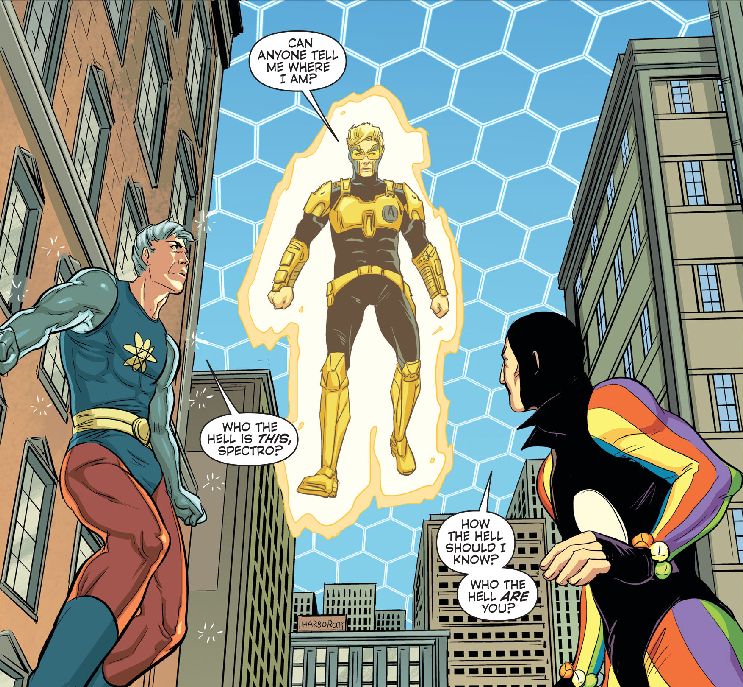 Metallo was sent to Dr. Emil Hamilton, who can keep him contained. The team calls it a day. Ice volunteers for monitor duty. 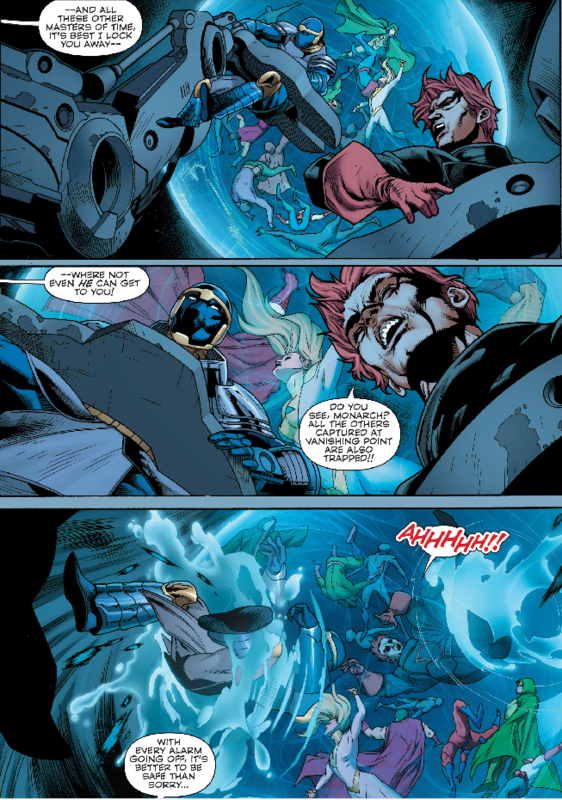 Blue Beetle and Martian Manhunter head for the workshop where Beetle begins repairs on the Bug. He complains that there isn’t time anymore to fix things. 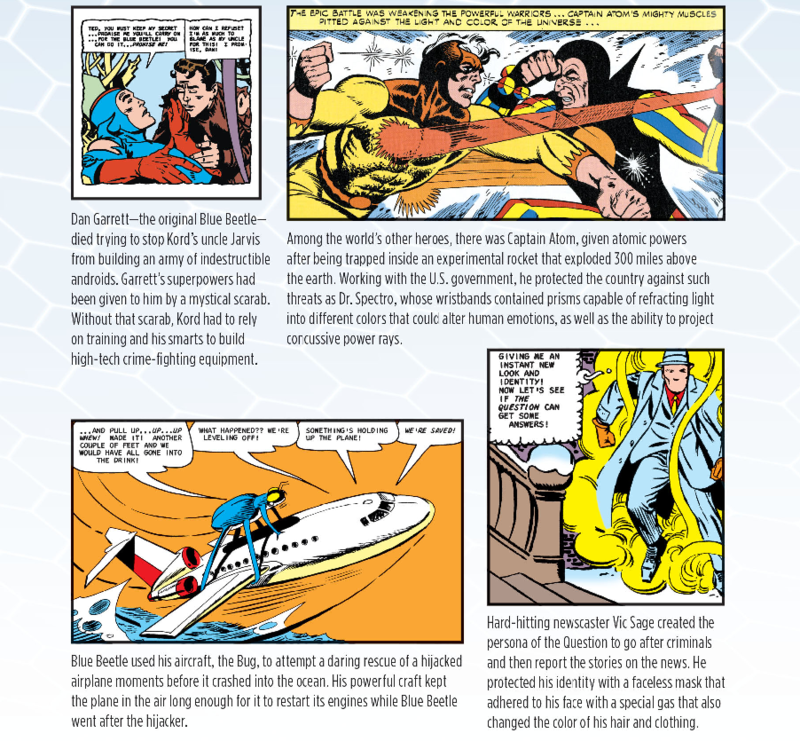 They mention an unsuccessful attempt to break the dome a year before and Beetle says things would be easier if Booster Gold were around. 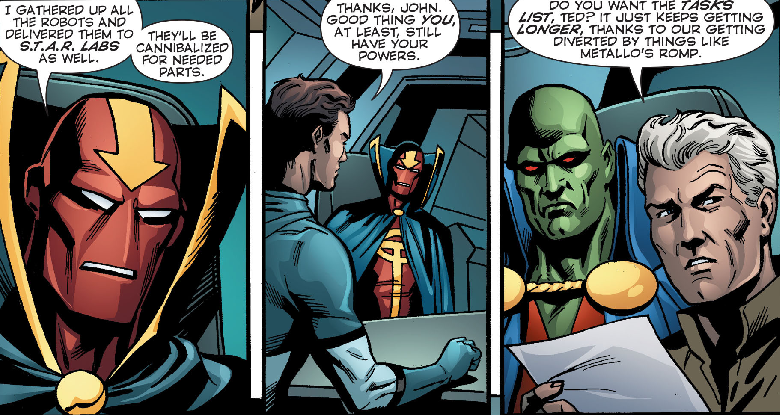 He says he never really wanted the leadership position and offers it to Martian Manhunter (who declines). 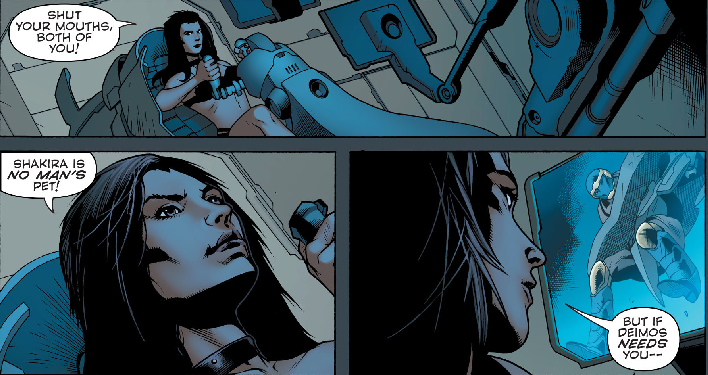 They are both troubled by their need to fight while at the same time having no one to fight. Ice rushes into the workshop and tells them to get to the roof. Telos is addressing the city. 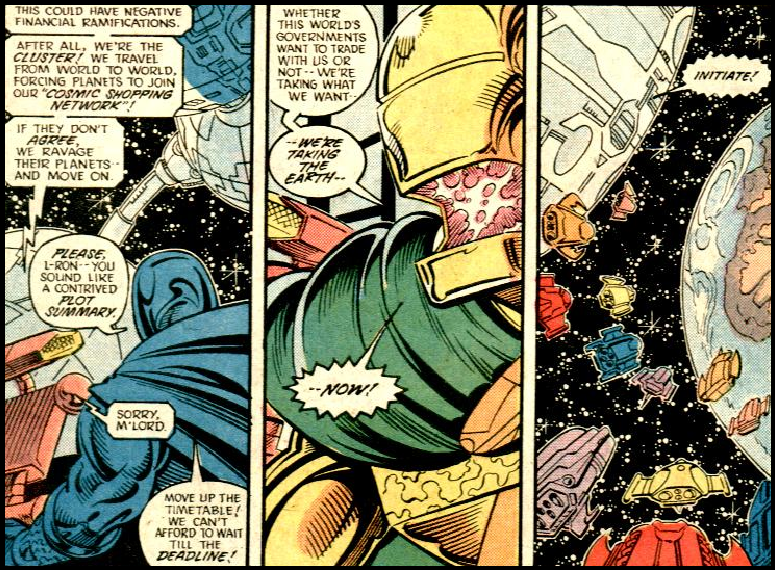 He announces that he is bringing down the domes and the various cities must fight each other to establish dominance. 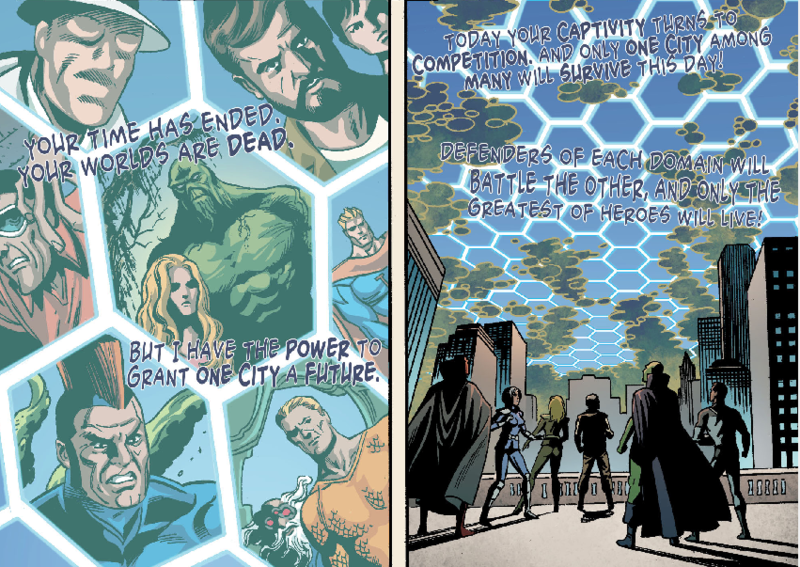 Telos warns that if any of the heroes attempt to circumvent his will, the citizens of the cities will “pay the price.” As soon as the dome is gone, everyone feels their powers returning. 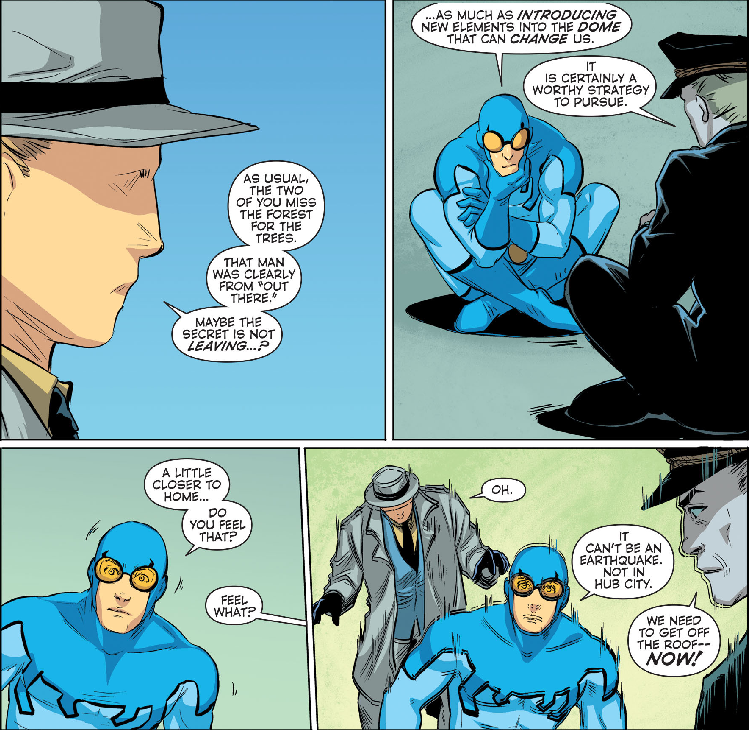 Blue Beetle says he doesn’t like feeling manipulated. 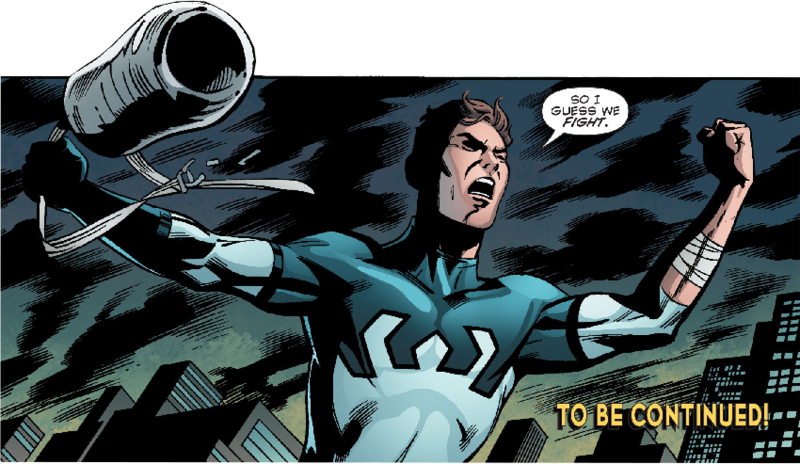 He doesn’t want to fight other heroes, he wants to fight Telos. 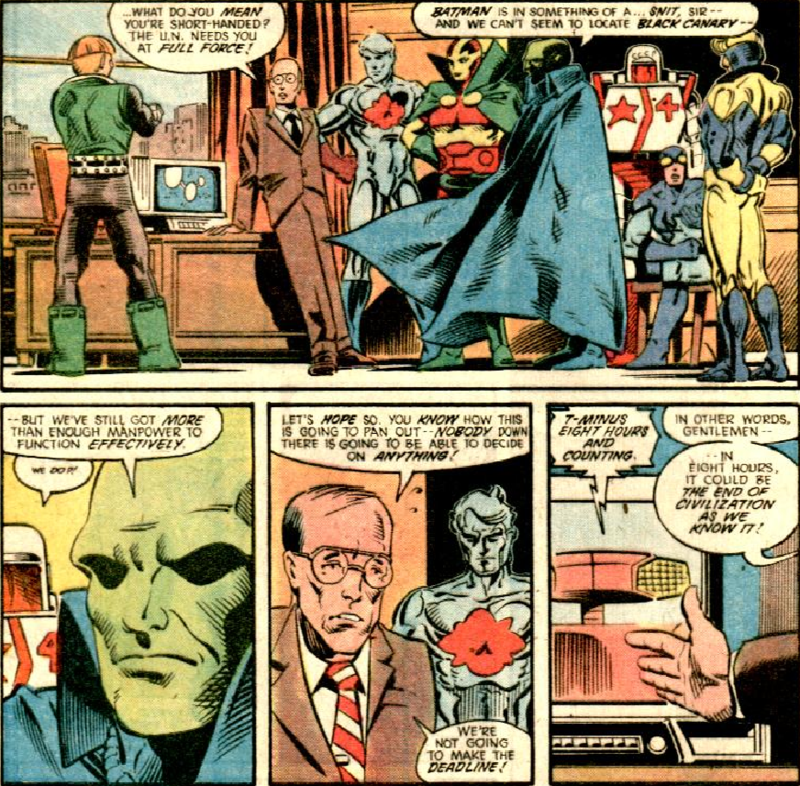 Martian Manhunter points out that this may be the only chance they have to save Metropolis and they need to embrace it. 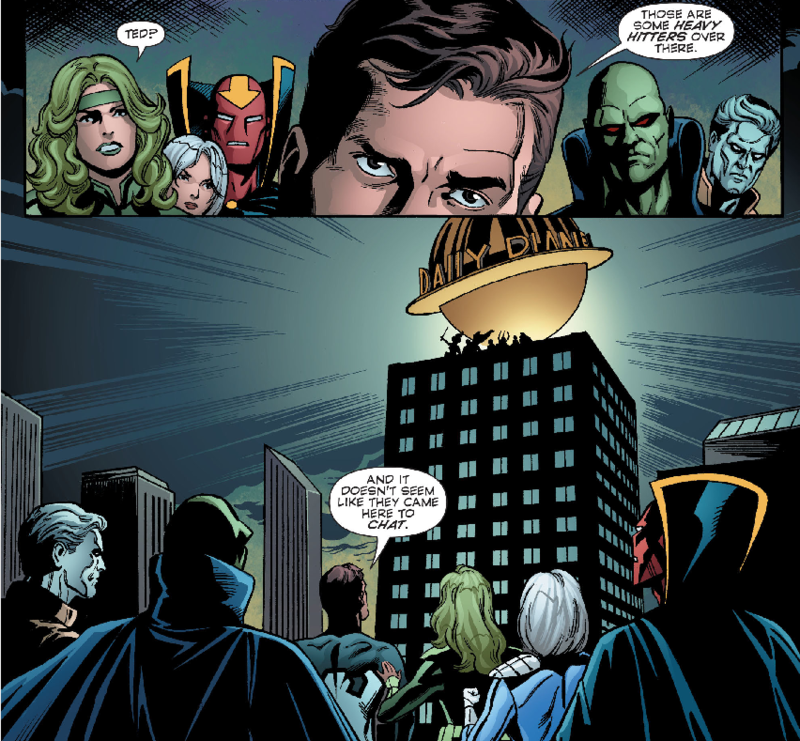 The sky darkens and a group of super-beings drop to the roof of the Daily Planet building. 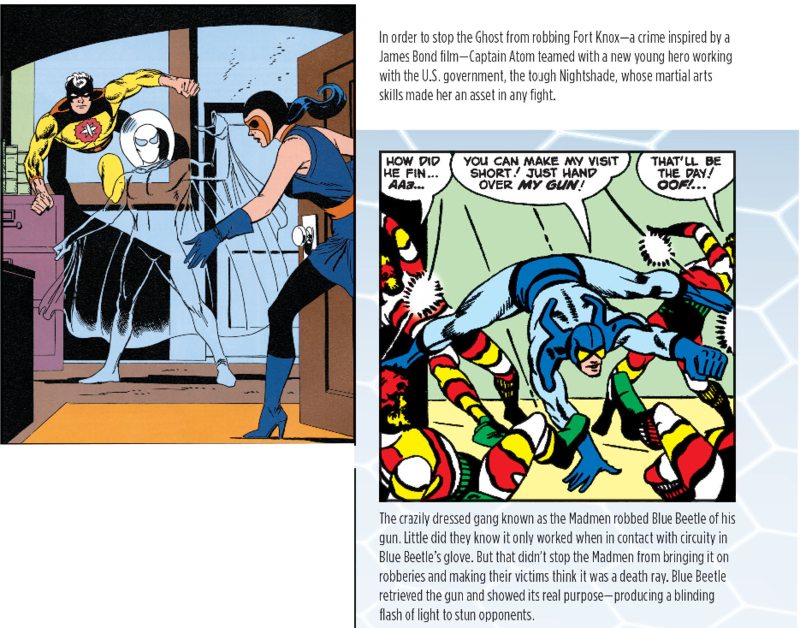 The group, led by Wonder Wonder, consists of Earth-22’s Shazam, Obsidian, Nightstar, Jade, Huntress, Creeper, and Blue Beetle. They are ready to fight whoever they can to establish dominance and save their world. 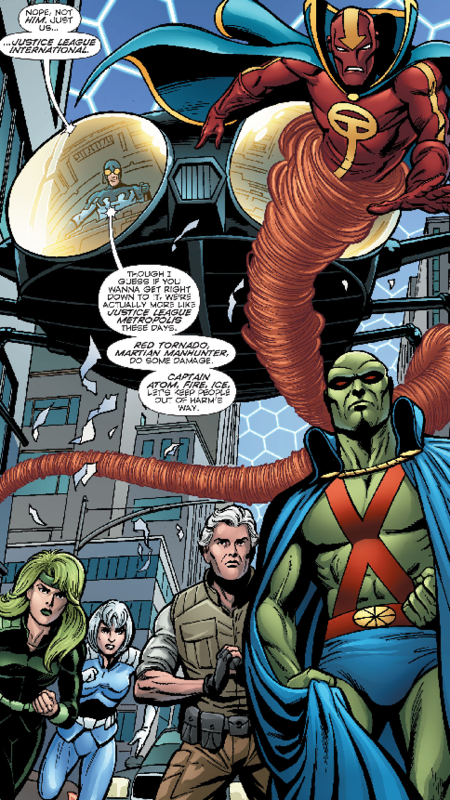 I have been a fan of Ron Marz since his excellent Green Lantern run in the mid-to-late 1990s. This is no exception. 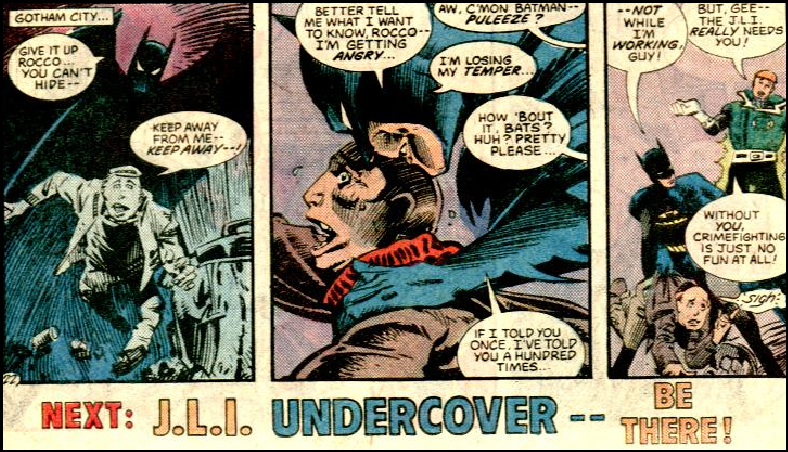 I love seeing the human side of super-heroes (Blue Beetle’s self-doubt, for example) and that seems to be something Marz excels at. 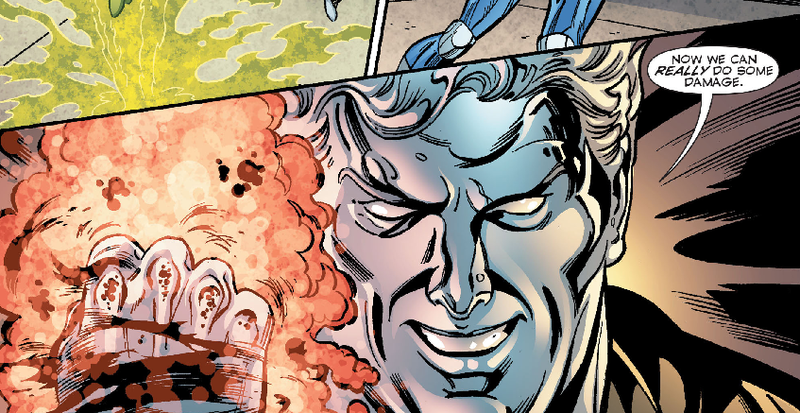 Mike Manley’s art is clean and crisp (I particularly like the menacing look he gave the newly-repowered Captain Atom). I’d say this book is an A. I can’t wait for the conclusion. 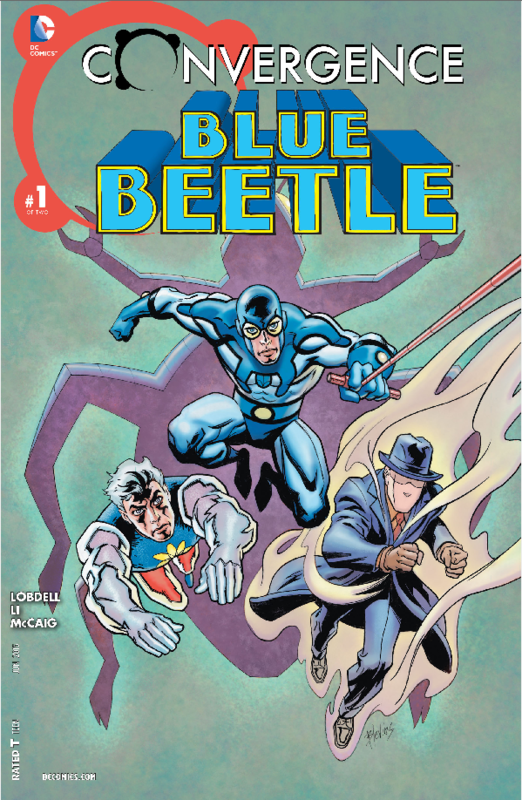 Blue Beetle versus Blue Beetle is the sort of comic book battle I love. 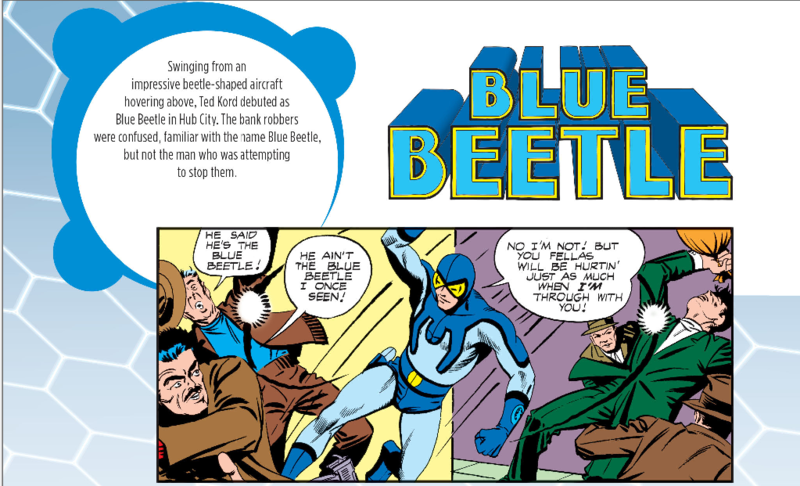 Until this issue came out, I had no idea how much I missed Ted Kord. But, did his broken arm really heal that quickly?